sorry for not posting, life is very very busy here for the next 2 weeks as I'm responsible for getting translators' laptops joined to the new wireless network we rolled out. Two quick notes I thought were cool. 1 - cracking a safe. Our safe battery died as we hadn't used it in 3.5 years, because we left it in the U.S. So I had to learn how to look up the safe schematics, and find out how to open the door with a dead battery. Not too incredibly hard, if you have the thought to look it up. I mentioned the story in passing to a friend, who today was sitting next to the finance manager here who happened to ask 'no one here knows how to open a dead safe do they'. to which he got the response 'Chad Owens might be able to help you'. So I got the request 'I hear you crack safes!' I replied 'no, I once opened 1 safe and it was hardly cracking, but let me see if I can help'. Within 20 minutes the safe was open. Thanks God for that experience on furlough. And because I had been blessed with friends who donated an iphone to me as well as taught me how to unlock it, I was able to the doctor unlock his previously broken phone. I give thanks to God, for giving me those two small experiences and turning them into a way I could be helpful here to people outside of my normal day to day job. Wow, God knows... He knows WAY ahead of time... and it's cool. My latest headache here is skype. Our internet connection shared across 500 accounts, is 400kbps download speed. Compared to your connection in the U.S., well yours is least 5 times that probably more, and NOT shared to 500 people. 2 years ago, a few people were using Skype. Today nearly everyone is using it. But my internet connection hasn't improved and it's killing my network. While I was on furlough the decision was made to run it through our web proxy. We run a proxy here for many reasons, not the least of which is web caching. As soon as that happened people started complaining of wierd slowness. Then I returned from furlough. I started investigating all these wierd slownesses. People began to complain about Skype not working all the time. I'd be caught in the hallway, called at home on weekends, asked to 'drop by and help'. It didn't take long for me to put 2 and 2 together and realize Skype was killing my network. Thankfully God saw this coming and saw fit to get two packeteers donated to us. So I've been pouring through the training manuals and I setup a lab and now, I'm a novice at it, but I'm able to do traffic shaping and keep skype at a low standstill. Unfortunately there is no way to divorce the skype protocol over proxy (port 443) from the proxy itself and so even though skype is failing it's still killing my proxy server. Skype is a wonderful tool for communication. It's a horrible protocol for a network administrator with a limited internet connection and a proxy. So... I need to find a way to completely kill Skype... everything else suffers until I do. The only way I've found so far is through a Cisco router running the latest ios, only I don't HAVE a cisco router. So until I can remove the proxy, or otherwise find a way to stop Skype, people here are going to be complaining about slow internet connection. then it hit me... what about a non-technical solution... simply ask everyone to uninstall skype! See what happens? See if it will work! Do I dare ask the community to uninstall the software that enables them to , albeit choppily, speak to their family? We now have a cell phone company here that will let us call several world regions for about 40 cents a minute, which isn't too horribly bad. I'm happy I found the cause, now I need to find the solution. But of course it works that way because you rarely are seeking a solution without first having a problem. 'in Chile in 1992 the population was roughly 14 million people. i have no idea what it is today." "The area of Chile is 292,258 square miles or 756,945 square kilometers for anybody that isn't American"
"Spanish is the main language spoken in Chile. I suppose it is because Spain ruled Chile before September 18th, 1818"
"I got all of my information from the 1992 World Book"
We run fibre under the ground to various buildings as our network backbone. It's Multimode 100mb fibre. We run it because that's what we can afford. This new bit of fibre we had donated to us is actually quite hardy underground, and less likely to break. As is our habit, we install a network cabinet wherever fibre is going to terminate and plug into a switch (cisco). But we don't have any fibre termination boxes so we make our own. We take a plastic hobby box, which is simply a plastic box with a cover, then we drill holes in it... sometimes we grind it down a bit so that the nuts will fit on the barrel connectors... then we put the fibre barrel connectors in, terminate the fibre with our handy dandy fibre termination kit (no we don't fuse them, we use some tyco bits that use gel inside, very easy to do) measure the signal, and we're a go. Above is a pic of one of our home made fibre boxes. We've made them out of anything we can get our hands on. 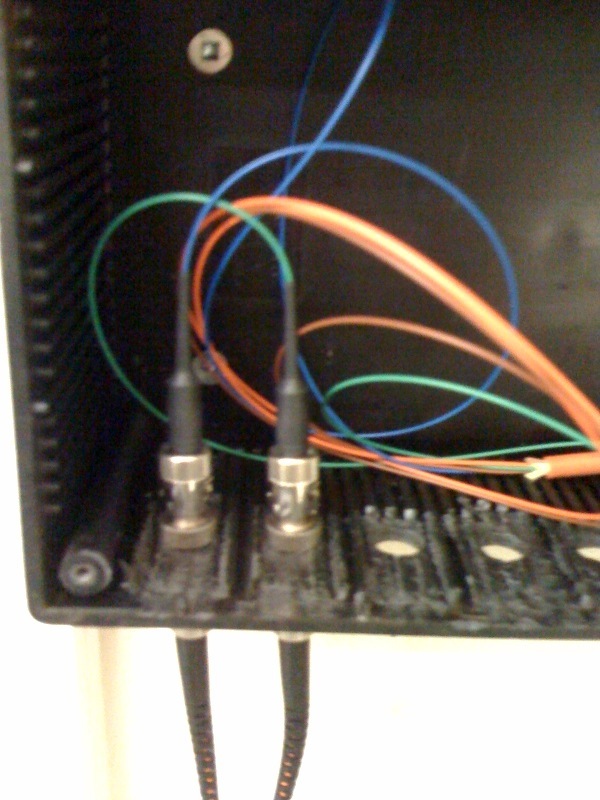 The last one we installed was made out of an old radio enclosure that we drill holes in. (a bent aluminum box). for all my coffee loving readers out there... today as I stepped outside of my office I saw this truck. 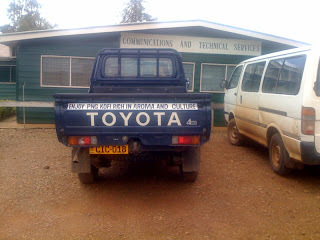 The Coffee Industry Corporation truck. Without that context the translation of the slogan on the side is sort of humorous. 'You and Me look out for coffee, and coffee will look out for you and me' In this context it means protect or watch-out for. Today is the anniversary of our 4th year here. We arrived in this country on this day 4 years ago. It was right before our 2 week meeting we hold every 2 years. We barely knew our way around, we hadn't started our jobs yet. Now we're settled, experienced, been doing our jobs for a while, have experienced many different things, met many different people, seen many new Bible dedications. It honestly seems like longer than four years in some respects. And in other respects much shorter than 4 years. you can pray for us as those 2 weeks of conference is when we come together to decide on our leadership and strategy for the next 2 years. For those who may have thought our kids are 'missing out'. They aren't. Here we make our own fun. Sure they may not have access to arcades and malls and 7-11's but they have tons of home made fun, which I think, is better anyway. 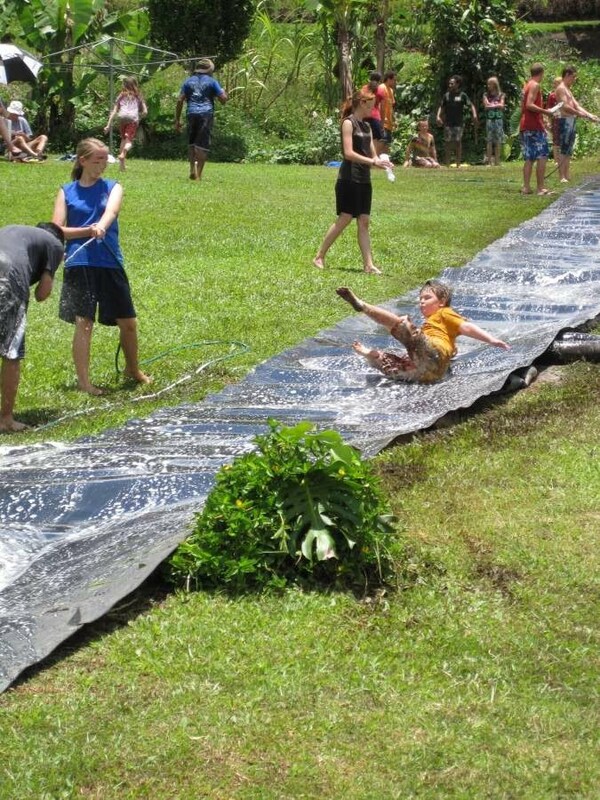 Every now and then the high schoolers pull out a big long thick piece of sheet rubber and roll it down the hill. At the bottom they put old mattresses. Then then run water and soap down it and let the kids have fun. Here's a few pics. So Saturday afternoon, while I was doing chores and my wife was doing chores, the kids walked up the dirt road a bit, and had an hour of slippery fun. So my son comes home last night, typical boy, and says 'oh yeah, tomorrow I'm supposed to wear a costume to school and you're supposed to bring dinner'. My wife is already under a lot of pressure right now, this was a bit too much so she said 'your teacher should have given us more warning'. And so my son's reply was 'well she told me weeks ago, I just forgot'. there will be no food, and any costume you wear you have to dig up on your own, we do not have time for last minute stuff like this. While alone my son came to me, wearing his made up custume of shredded rags and said 'dad I'm supposed to be a native south american, and I need something for my head that makes me look like an indian'. So I replied 'well if only you had a Cleveland Indians cap.' as a joke. Apparently a year ago my daughter found a baseball cap at a yard sale here, and picked it up for him. He wore it rarely in the sun, because he wasn't an Indians fan. But he came back wearing it and was happy. Thank goodness because I'm sure many of you know how unhappy a child who doesn't have a costume for school can be. Two friends of mine are new translators and recently got back from a several month stay in their village. They were not expecting people there to know about Christ, obviously, otherwise they would not have become missionaries to go. But what they found was a bit surprising. They had been told about cargo cults before. We all have heard about them. But apparently in this particular language area, there is a very strong cargo cult. Cargo cult is a term that can mean a variety of things. The core of the idea is that there a religion has been built around the idea of how to get stuff. In this particular area, they have a complex structure of beliefs that revolve around stuff. So what he found was a very attentive audience listening to him talking about the Gospel because they believed that because he had white skin, he was an emissary from heaven to teach them all about how to get more stuff. No one wanted to offend them, because if the white saints leave, then they will never unravel the secret to finding more stuff. Their system is so ingrained in them, that they in fact have no problem believing some basic tenants of the Gospel because they, from the perspective of a cargo cult, only make sense. They don't reject the Gospel, they simply see it as more evidence that the white people understand more about life in general and therefore they want to be more like what they understand Christ would be like. It makes for a very difficult obstacle to reaching them with the TRUTH. However, one thing works in my friends' favor. They have a seeking heart. They desire to learn, and know and understand! Pray with us that this cargo cult mentality will find the Truth, and that our friends will have the wisdom to know how to pierce it with God's truth. For those asking, PNG was not hit hard by the Tsunami. We live at 5000 feet above sea level, but our major places of supply are at sea level, as well as several translator villages and regional centres. All we saw was minor flooding. We are praying for those who saw much worse. There have been reports of minor flooding in Papua New Guinea from the tsunami triggered by Japan's massive 8.9 magnitude earthquake. The PNG National Disaster Centre says unusually high tides caused flooding in low-lying areas of Manus Island and Wewak on the north-east coast. Manus governor Michael Sapau says residents on the island's north-west coast reported that the sea rose by around a metre in the early hours of this morning. Mr Sapau says officials have been sent to inspect the affected areas, but early reports do not indicate any serious damage. "Minor inundation, no major damages," he said. Meanwhile, residents on New Ireland in PNG's far north-east say the tide rose and fell several times in quick succession last night but there has been no flooding. At the head of the room a man spoke in a language I didn't understand, and held out a 2 kina bill. Later he said in English 'I was saying that I have this 2 kina bill, anyone here can come and take it, it is my free gift to you.' No one took it because no one could understand him, he was speaking in Spanish (de Costa Rica). The illustration proved the point that people couldn't know about the Gospel or using the Word unless they understood the language. Yes we translate the Bible. Then what? That's the question. Well anyone in the know, please pardon my over simplification of this process. Translating the Word takes over 20 years. During that time you're working on relationships, developing leaders, discipling, teaching reading and writing, giving tools on how to teach the Bible, giving audio and video examples, teaching skits, and overall preparing a culture anywhere from 'we don't want the Bible' to 'we really can't wait' and in a perfect scenario, by the time the Word is published in their heart language, the people are already changed and can't wait to deploy the Scriptures to their children and surrounding people. In a less than desirable situation you have a people with a new Bible who never use it because they don't grasp how to teach from it. Enter the Church Engagement team. A relatively new team, but the ministry is something that has been going on for decades. Still the team itself goes into churches and sees how they are integrating with the Word and where they need help and then puts them in touch with the right help. They've heard things like 'well we have the bible but no one uses it'. OH, they need to talk with the Scripture use team who will help them understand how to teach others and use the Word of God to make an impact. This team is still small and growing and it's a side team (work on weekends) the people on the team have their normal jobs to do too. But on the weekends they make a job of trying to work side by side with people and show them how to really teach from and use the Scriptures they have. We have a lot of resources here, and this new team is trying to get those resources in the hands of local pastors and leaders. WE have identified over the years that there can be some falling through the cracks, and this team is there to fill in the cracks. That's of course my perception of it, and I like the idea. They've recently been challenged by the huge amount of interest they are generating to supply people with the answer to the question 'How do I get involved' ? 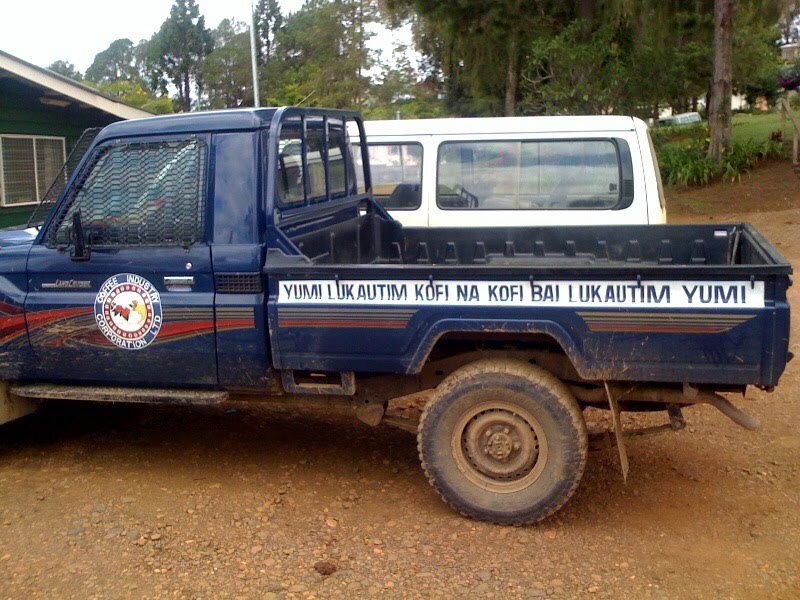 The side effect of this is that they are generating interest in the country by Papua New Guineans as to how to get involved in the ministry of spreading God's Word. That's incredible. They've recently listed a need in the area of video/audio production, and I'm currently considering volunteering. I think it might be too much too soon, to volunteer my weekends to producing video, but on the flip side, I know I'd enjoy it tremendously. The couple featured in this coming documentary are one of the first couples whose laptops I helped configure for village email. In fact possibly they are the first PNG translator couple I met and helped in this country. We spent many hours together and I prepared their systems to be secure and receive email in their village, so when I run into them I occasionally ask them how things are. I remember clearly a conversation I had with them about how they love getting email from their son, and how they wished their son would write them as often as I write my family. In fact they asked me years ago to call their son (jokingly) and tell him to write their mother more. I'll be interested when this film is released to see more about their village life. theft of portable devices is at times a problem here. So I'm always telling people to buy laptop locking cables. I purchased 5 while in the U.S. combination style because I have tooooooo many keys. Anyway, I had to secure a new Apple mac mini. There are several on center here and I noticed, they have no locking slot. So... what to do? If you go online you can find a lot of mounting/securing mounts for $60.00 or more. Well I found one for $40. I wanted a 'behind the monitor/swiveling' mount but none existed. SO, I bought the cheap $40 one. It came 3 weeks later. I then looked at my monitor, it's an old NEC with a ton of extra plastic around the metal stand, so I figured, I could drive the screws into the plastic, being careful not to damage any internal cables or cause a short. And I did. The result is, a swivel 'under the desk' mount, attached to the back of a monitor. I had to sacrifice the pedastal up/down motion of the monitor stand, but I never use that anyway. Then a simple padlock secures it, since the monitor itself is already cable locked in place. Viola! .... clean, hidden, accessible, and.... SECURE. Effectively turning my monitor into an 'iMac' like system. We get our groceries from LAE(the city 3 hours away). Some in country, some imported. Between us and LAE , there are multiple bridges and a long winding road called the Kassam Pass. One of the bridges is out, and the Kassam pass is damaged so much that big rigs can easily topple. Last week 2 big trucks toppled and blocked the road. Only small 4 wheel drives were able to squeak through. So grocery supplies will be less often. Due to our king air aircraft receiving suspected engine damage, and our standardization on new kodiak aircraft, coupled with the loss of key personnel in Aviation, we no longer have the capacity to fly people to Cairns, Aus. (Unless for medivacs). Which means that goods we ordered from Australia, will only come back to us when someone is rushed to the hospital. Or possibly they may start a cargo flight only without passengers (it takes a LOT of paper work to fly people internationally and without staff to push the paper.... we can't do it). So what that means is that if I wanted to order say, laptop replacement parts, instead of waiting 30 day like we used to, I may wait 90 days to receive them. What this means is that a translator's crashed laptop has to wait longer for repair or replacement. These are some of the major changes to our way of life here. It cuts us off from the rest of the world just a little more than we were, but my attitude is, 'if I came here today, ready to take on whatever came, I wouldn't lament the loss of these services because I wouldn't have known about them.' In my heart I know, that things change, and we all need to be willing to flex without it affecting our attitudes in a negative way. We're not here to receive cargo and food, we're here to spread the Word of God, and frankly, if things get harder in doing it, well it just makes us better. The more we can endure, the more we share in Christ's suffering. Not that a sugar shortage or loss of cargo is suffering... but you get the idea. All in all, we are seeing a real shift here that affects our daily lives. My hope is, that people won't be frustrated by life being more difficult but will instead see these luxuries as distractions and we can continue to go about the work we're called to do. The practical reality is, if people find living here too tough they may want to go home. Then again I think there is a contingent of people who feel life is not hard enough and enjoy it when things get harder. I look on with curiosity and wonder where God is going with all this. God is faithful! In reading Mark 8, I become convicted. God is faithful, we'll get what we need to continue this work, no need to worry.